Data analysis is a process in which inspecting, transforming, cleaning and modeling the data takes place. With the help of this data, we can make the goal of discovering useful information, suggesting conclusions and supporting decision-making. In the process of Data Analysis, excessive use of MS Excel is done for preparing charts, tables, professional reports and various other data analysis functions. MS Excel, therefore, acts as the powerful tool for making better decisions. Data analyst excel test helps recruiters and hiring managers to assess candidate’s analytical and critical skills while working with excel data. Interview Mocha’s excel test for data analyst position is created & validated by experienced subject matter experts (SMEs) to assess & hire data analyst as per industry standards. Moreover, this data analysis skills test in Excel contains case study and scenario-based questions that provide insights of candidate’s practical knowledge. Interview Mocha’s data analysis interview test has a unique set of questions. You can also create or ask us to create a customized test that includes questions which are specific to your job-requirement. Data analyst skills test may contain MCQ's(Multiple Choice Questions), MAQ's(Multiple Answer Questions), Fill in the Blanks, Descriptive, Whiteboard Questions, Audio / Video Questions, LogicBox( AI-based essay evaluation), Job-based Simulations, True or False Questions, etc. 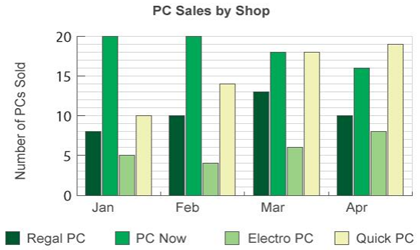 If the average profit made on each PC sold by Quick PC was $62, what was the total profit over the four months for Quick PC?